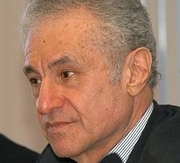 Gar Alperovitz, Lionel R. Bauman Professor of Political Economy at the University of Maryland, is cofounder of The Democracy Collaborative. He is a former fellow of the Institute of Politics at Harvard and of King’s College at Cambridge University, where he received his PhD in political economy. He has served as a legislative director in the U.S. House of Representatives and the U.S. Senate, and as a special assistant in the Department of State. Earlier he was president of the Center for Community Economic Development, Codirector of The Cambridge Institute, and president of the Center for the Study of Public Policy. Gar's newest book speaks about where we find ourselves in history, why the time is right for a new-economy movement to coalesce, what it means to build a new system to replace the crumbling one, and how we might begin. It also suggests what the next system might look like. He proposes a possible next system that is not corporate capitalism, not state socialism, but something else entirely – and something entirely American. Marcus Raskin reads from The Four Freedoms Under Siege: The Clear and Present Danger from Our National Security State. ; Gar Alperovitz reads from Unjust Deserts: How the Rich Are Taking Our Common Inheritance and Why We Should Take It Back. Gar Alperovitz discusses Unjust Deserts: How the Rich Are Taking Our Common Inheritance and Why We Should Take It Back. Gar Alperovitz discusses America Beyond Capitalism. Gar Alperovitz is currently considered a "single author." If one or more works are by a distinct, homonymous authors, go ahead and split the author. Gar Alperovitz is composed of 2 names. You can examine and separate out names.